His Philosophy Criticized by Maimonides. Translations of His Medical Works. Greek physician and philosopher; born at Pergamus, Mysia, about 131; died about 200. Eclipsed by those of Aristotle, Galen's philosophical works were not held in high esteem by the Jews. Maimonides cites them only when they are in accordance with his own views, as, for instance, with regard to the impossibility of proving the eternity of matter ("Moreh Nebukim," ii. 15). Once he severely criticizes Galen, declaring that outside the field of medicine he is no authority ("Pirḳe Mosheh," xxv. ), this stricture being called forth by the following utterance by Galen concerning the Mosaic conception of the omnipotence of God: "The difference between the Greek philosophers and Moses is this: In order that matter may be put in order it suffices for Moses that God should wish matter to be arranged. He believes that everything is possible with God, even the conversion of ashes into a horse or an ox; while we believe that there exist things with which, being naturally impossible, God does not interfere; He chooses only the best between possibilities" ("De Substantia Facultatis Naturæ," ed. Kuhn, iv. 760). Falaquera also shows slight respect for Galen's philosophy, affirming that in his later years the great physician wrote a work betraying ignorance of physics ("Mebaḳḳesh," p. 33). ("Ars Parva"), with a commentary by All ibn Ridwan, translated, according to Paris MS. No. 1114, by Samuel ibn Tibbon in 1199. The same work was translated anonymously, under the title , between 1197 and 1199.
, a paraphrase by Zerahiah ben Isaac ben Shealtiel of Rome (1277-94), in four books: (1) on the diversity of maladies; (2) on their causes; (3) on the variety of symptoms; and (4) on the causes of the symptoms. , three treatises on the compounded medicaments according to their species, by the same. , on the crisis, by Solomon Bonirac of Barcelona (1300-1350). On bleeding, by Kalonymus ben Kalonymus, in 1308. ("De Clysteriis et Colica"), by the same. , on the regimen of the epileptic boy. ("De Malitia Complexionis Diversæ"), by David ben Abraham Caslari (1280-1337). 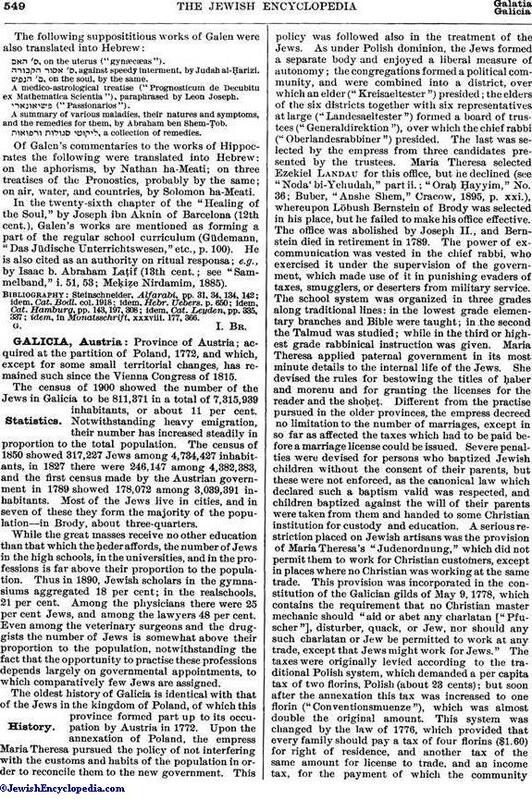 , summaries of the Alexandrian school, by Simson ben Solomon. These summaries contain the following treatises: , on the medical sects; or ("Ars Parva"); , on the pulse; , chapters from the treatise on the urine; , on marasmus; , on nature; , on the elements according to Hippocrates; , on the temperament; , on the faculties of nature; , on anatomy; , on maladies and their symptoms; , on a knowledge of diseases of the internal organs; , on the various kinds of fevers; , on crisis; , on critical days; , on the art of healing; , on hygiene; and , on melancholy. , on the uterus ("gynæcæas"). , against speedy interment, by Judah al-Ḥarizi. , on the soul, by the same. A medico-astrological treatise ("Prognosticum de Decubitu ex Mathematica Scientia"), paraphrased by Leon Joseph. A summary of various maladies, their natures and symptoms, and the remedies for them, by Abraham ben Shem-Ṭob. , a collection of remedies. 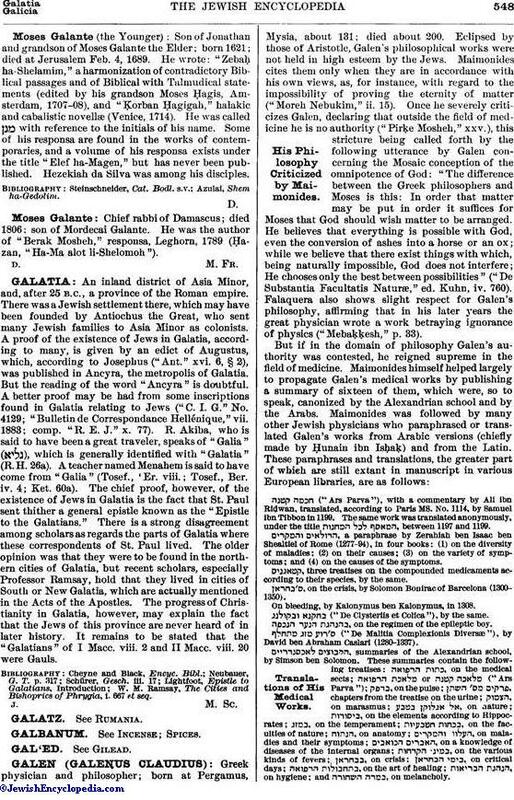 Of Galen's commentaries to the works of Hippocrates the following were translated into Hebrew: on the aphorisms, by Nathan ha-Meati; on three treatises of the Pronostics, probably by the same; on air, water, and countries, by Solomon ha-Meati. In the twenty-sixth chapter of the "Healing of the Soul," by Joseph ibn Aknin of Barcelona (12th cent. ), Galen's works are mentioned as forming a part of the regular school curriculum (Güdemann, "Das Jüdische Unterrichtswesen," etc., p. 100). He is also cited as an authority on ritual responsa; e.g., by Isaac b. Abraham Laṭif (13th cent. ; see "Sammelband," i. 51, 53; Meḳiẓe Nirdamim, 1885). idem, in Monatsschrift, xxxviii. 177, 366.